Annalie Aplin, A15, hoped to boost awareness of Tufts' Department of Art and Art History and offer its students new writing opportunities when she launched Medium in the spring of 2015. "Medium is getting the word out about the work we do as art history students," Aplin said, describing Tufts' new undergraduate art history journal. "There are so many incredible ideas that we're now able to showcase." A digital collection of undergraduate student writing, Medium features essays and art critiques, including reviews of exhibits in New York and the Greater Boston area. The journal also provides news and profiles of art and art history alumni. Aplin conceived of Medium last fall after she completed a summer internship at a New York City art finance and advisory firm. After seeing an art history journal her fellow interns had published at the University of Southern California, she realized that there was no equivalent outlet in the Tufts community. Aplin's vision for Medium included not only critiques of visual art, but also art history, film, and architecture. "Tufts is known for the strength of its art history department," she said. "The professors and graduate students involved are doing things in the art scene, and it's great to have them as resources and mentors. The students in the undergraduate department are talented and passionate. It's been exciting to give students a formal outlet to showcase their work." To bring the idea of Medium to fruition, Aplin, who was also president of the Tufts Art History Society, recruited nine students to help plan, design and publish the journal. Several members of the team submitted their own articles, joining the many submissions of their peers, to launch the first issue. "I always thought a journal like Medium ought to exist," said Amanda Walencewicz, A17, who helped select and proofread the articles and also designed Medium's cover and layout. "It filled a void in the publications area where sciences and social sciences research often get the most attention. But there can be some really enlightening, interesting pieces written about the arts, too." The inaugural issue of Medium showcases the work of six students and covers a wide range of topics. Danielle Kupfer, A18, scrutinizes the body within Carlo Crivelli's Renaissance painting Lamentation over the Dead Christ. Medium Head Editor Natalie Noar, A15, writes about medieval leather bookbindings as a means of advocating for a new approach to art history. In future issues, Walencewicz hopes to see original student artwork, as well as an expanded reviews section including reviews of galleries and museums in other countries from Tufts students who are studying abroad. Although a few of Medium's founding members, including Aplin, have graduated, a dedicated group is ready to take the publication to the next level. Claire Selvin, A16, an art history major, succeeded Aplin in the fall, and Aplin, whose goal is to work in the business side of the art world in New York, plans to help. They are actively seeking staff and contributors. Aplin noted that the students who created Medium's first volume were not exclusively art and art history majors. Instead, the writers came from a variety of academic backgrounds, such as French, biochemistry, and civil engineering. "That's a great thing about Tufts," says Aplin. 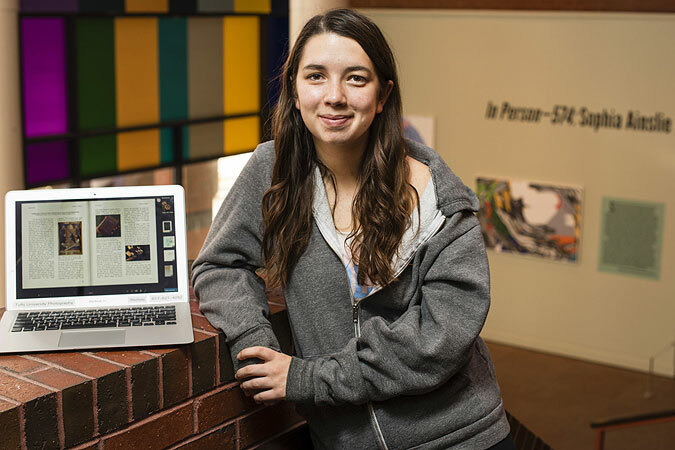 "A lot of students who are interested in art have other passions, and vice versa," she said. Professor Ikumi Kaminishi, the director of undergraduate studies in the Department of Art and Art History, gave Aplin the extra push to build a team. "I was thrilled to see this proactive initiative by an undergraduate and approved her plan on the spot," Kaminishi says. Kaminishi suggested a digital platform for Medium in the hopes that a web-based project would reach a wider audience. She was particularly impressed by Aplin's addition of a section featuring graduate and post-graduate students: the premiere volume featured an interview with Carly Boxer, A13, who is working towards a doctoral degree in Medieval art history at the University of Chicago. "This networking, so that our students will stay connected, is a great idea," says Kaminishi. "The new journal affects not just those who pursue a career in art history but also those who are interested in museum studies, journalism, media, editorial, and graphic arts." Kaminishi hailed Medium as an outstanding undergraduate accomplishment, especially given the students' hectic schedules and tight deadlines. "Starting a new project is not easy," she said. "Annalie and her cohort created something intellectual and meaningful."